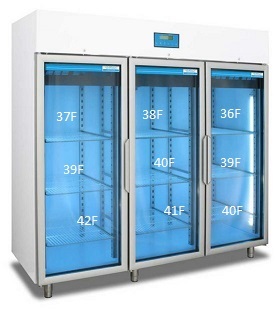 ACE Medical Equipment has extensive experience with refrigeration, and can serve your needs regardless from how modest or impressive your cold storage solutions are. We have worked with refrigerators and freezers of all varieties, ranging from mass-market off-the-shelf solutions to specialized laboratory hardware. Due to heightened quality requirements from regulatory bodies such as the NYS DOH, from customers and from internal quality assurance guidelines, equipment calibration is more important than ever. As an NYS DOH-regulated company, you may be audited for your compliance with NYS-DOH regulatory requirements – either GLP (Good Laboratory Practices) or GMP (Good Manufacturing Practices). The NYS-DOH requires that the display accuracy of all instruments that have an effect on the quality of your product be verified (calibrated) over a specified interval of time. We can help you to achieve high standards that you are striving for, and achieve full functional compliance with all regulations. ACE Medical Equipment provides on-site centrifuge calibration using high accuracy equipment. Our Ultra-Class calibration tools uphold unsurpassed industry leading accuracy. This level of accuracy ensures precise results even for customers who maintain the most stringent process tolerances. Upon completion of calibration, ACE Medical technicians will leave you with detailed calibration certificates, with information on as-found data, as-left data, test point deviations, instrument tolerance and instrument operating range. Refrigerators/freezers allocated for the storage and handling of products with a specified labelled storage temperature require mapping. A temperature mapping exercise is mandatory for any space allocated for the storage of products and articles with a specified labelled storage temperature. Said exercise, a study of the internal temperature ranges, establishes the temperature distribution within the zone being mapped and locates hot and cold spots. The collected data provides an essential source of information to ensure that all products are correctly stored within their labelled temperature range(s). Mapping may also be used to identify zones where remedial action needs to be taken; for example by altering existing air distribution to eliminate hot and cold spots, or rearranging the stored contents so as to maximize convective airflow. Mapping typically takes 24 hours to create an accurate chart of temperatures in the storage refrigerator/freezer.